Thank you to Stu and the McKechnie family for all of your contributions to Elmwood. The dedication is very much appreciated. Your efforts have greatly added to the culture of Elmwood, you have added a little music to our coarser natures. Summer band concerts are a great time for families, Elmwood wants to thank your family for making your lives here. This summer the annual Central Park Municipal Band Concerts will end marking a very special anniversary. After 52 years Stu McKechnie will end his service as the director. He will continue to participate as a band member. The Peoria Journal Star feature story on Saturday detailed this ending of an era in Elmwood history. 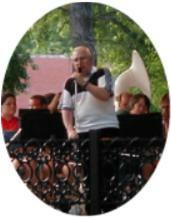 Click to Read a History of Lorado Taft's "The Pioneers"
Elmwood Band celebrated a 150 years in 2010.